Creamy and delicious, this Cauliflower Potato Soup hits the spot at dinner. Load up your bowl with all your favorite baked potato toppings. Place ingredients into slow cooker. Cook on high for 3 hours (or low for 5). Using a hand immersion blender, carefully puree soup directly in pot until smooth. If you do not have an immersion blender or hand blender, you can use your blender to process your soup so that it’s smooth and creamy (see note below to learn how to do this safely). Once cauliflower and potatoes are processed, stir in milk and Greek yogurt. Taste for salt and pepper. 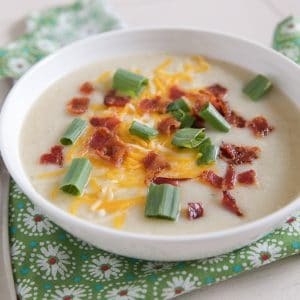 Serve with shredded cheese, chopped green onion and cooked crumbled bacon. If you don’t have a hand blender: use your blender to process your soup so that it is smooth and creamy. Let your soup cool down as much as possible before starting the blender. This post on NoshOn.It is a great tutorial on how to puree hot soup in a blender without and explosion. Please watch before using this method! I highly recommend a hand blender to make creamy soups like this. This is the hand blender I have been using for several years. It is worth it and you can use it for so many soups like this one as well as tomato soup.